Just the gradient. The basic gradient seems to be more limited. Yes, the situation with the manual is a mess! This is an extremly complex new feature, but no help in cinema, and the online manual misses many nodes. And I don’t know if there is an english version yet. However, the projection node is contained in the german online help at least. For those still confused. In the project settings, enable the "use color channel for node material’ option. 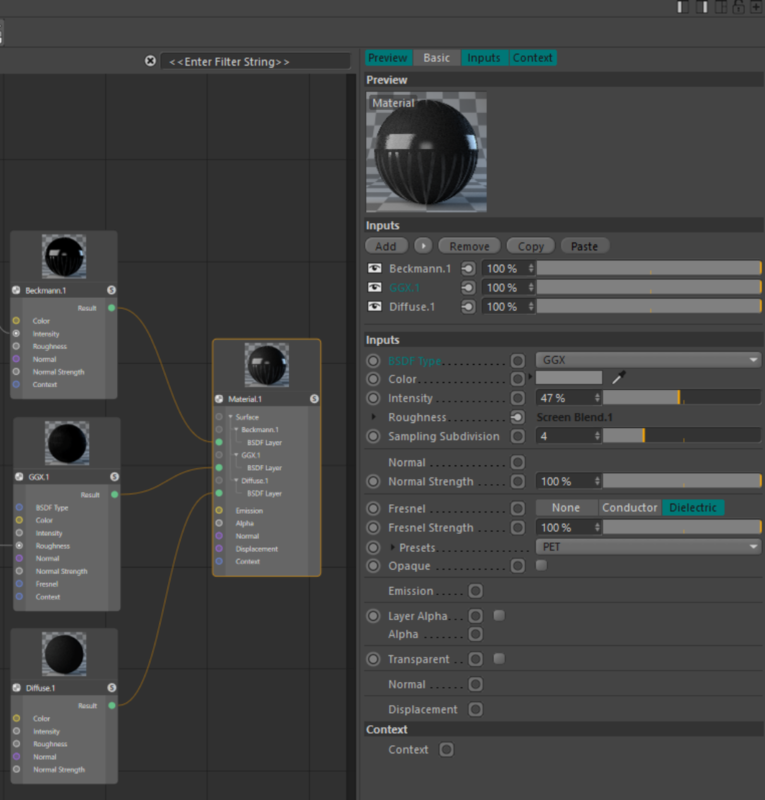 This switches all reflectance/diffuse channels into traditional c4d colour channels. All the render speed should return and you can now use GI if you wish. I can’t get a 3d Gradient working. I try to get a gradient beeing black in world 0 and white in a distance of 200 in anny direction No matter If I move the object. ok next question. I want to trigger a displacement with a 3d noise. so I stick a noise with 3d projection into the displacement of a node material. put the material on a sphere and the displacement is not as expected displacing in normal direction but somehow in world direction. rotation of the object doesn’t change anything. I am not new to material nodes, but with this system I feel a bit lost. Did you use the “Displacement Map” node as well? I think what’s important to keep in mind before working with this system: it is not intended to be a direct replacement of the the previous system with old shaders and also workflows being directly transfered. Instead, it is much more basic. It seems to me you will need several nodes to achieve what one of the old shaders did in most cases. This can be frustrating at the beginning, but will give us more power. That is at least my feeling after playing around with it only for a few hours. The 3D gradient is a very prominent case as most of us use this very often, I am sure. yes it is much more basic. I am not jet shure if I like that. But as long there is the old materials system it might be good, that there also is a really advanced one. Also I have the impression, that this is the beginning of a unified node system for xpresso material and compositting… we will see. so my “very basic” findings. It is a good bet, to connect inputs and outputs of the same color. That means that you will basically have to put a “converter” node between your image/noise and BSDF, Alpha, Normal and displacement. But this seems to be more a guideline than a rule. you can put in a noise directly into the alpha, while the correctly colored output of the displacement_map node might lead to strange results when connected to the Normal Input which has the same color. I can not find out node which hold instance of another material(node or scene material) and possibility to vfx blending 2 materials at one. How or need to ungoup assets and somehow blend them? Hey. There is no such possibility. You can only mix BSDF channels. Now available are diffuse (lambert) BSDF and several reflective BSDFs (Phong, Beckman, GGX) There is also an emission channel. I also noticed that the correct BSDF transparency channel is missing. The transparency layer is embedded in the final material which is wrong. Because of this, it is not possible to mix several transparent materials to get ice, or the effect of dispersion. There are also no BSDF for subsurface scattering and its individual components such as absorption and scattering. In Prorender, such BSDFs exist, so I think Maxon will do them. I can not see how to make For loop (link) in mat.editor?